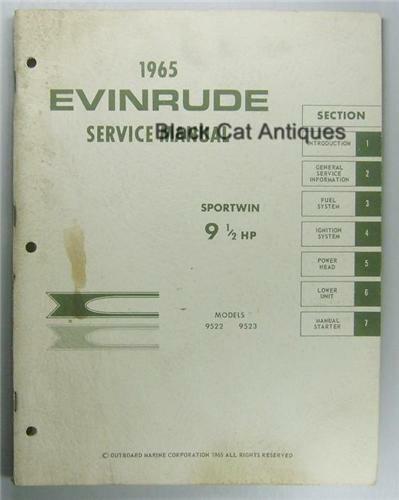 Up for sale, we are offering an original, 1965, Outboard Marine Corp., service manual for Evinrude Sportwin 9.5 HP, models 9522 and 9523. ** Please enlarge photo #2 to verify models covered by this manual. This is a used manual from a local marine and small motor business with important parts information on these classic outboard motors. Condition: This guide is used and soiled, however it is easily readable and useable. Please enlarge the photos to determine the condition of the guide. Size: The catalog measures approximately 11" long by 8.5" wide.